Annotation: We are in Oxford in the 1660s a time, and place, of great intellectual, scientific, religious and political ferment. Robert Grove, a fellow of New College is found dead in suspicious circumstances. A young woman is accused of his murder. We hear about the events surrounding his death from four witnesses Marco da Cola, a Venetian Catholic intent on claiming credit for the invention of blood transfusion; Jack Prescott, the son of a supposed traitor to the Royalist cause determined to vindicate his father; John Wallis, chief cryptographer to both Cromwell and Charles II, a mathematician, theologican and inveterate plotter; and Anthony Wood, the famous Oxford antiquary. Each witness tells their version of what happened. Only one reveals the extraordinary truth. 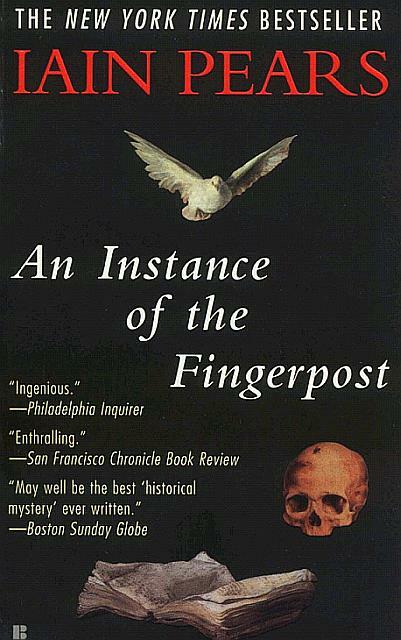 An Instance of the Fingerpost is a magnificent tour de force an utterly compelling historical mystery story with a plot that twists and turns and keeps the reader guessing until the very last page.